The West Virginia Mine Wars Museum volunteer team is happy to come to your event, gallery--and soon, classroom--to share the lessons of the Mine Wars with your community. Interested? You can find more details below! Our tabling display is available to be featured at community days, fairs, and other public events. It showcases informational placards about the Mine Wars era, including a timeline of events and biographies of Mine Wars heroes, as well as artifacts such as company scrip, a miner’s lamp, and bullet casings from the Blair Mountain Battlefield. 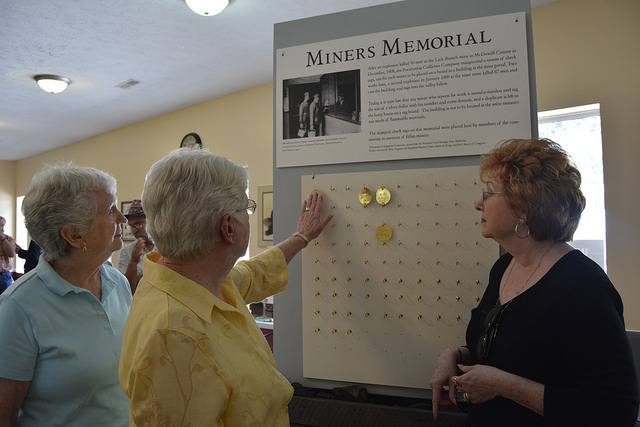 Moreover, the display also includes an interactive element where visitors can make check tags to be added to our Miner’s Memorial exhibit. A staff person from the Museum must accompany the tabling display at all times. Our new Miner’s Memorial exhibit is available to museums, art galleries, and other public and cultural centers upon request. Contact us now to make arrangements! The exhibit tells the story of the history of mine disasters in West Virginia. The exhibit is a 3-sided kiosk. Its panels include a video history, a story board with photos and text, and an interactive panel that allows visitors to create a check tag in honor of a fallen miner that then becomes a part of the display. Because of the interactive nature of this exhibit, it is best suited for a place that has staff or volunteers who can assist visitors to participate. The host must keep the exhibit for at least six months. West Virginia Mine Wars samples lesson plans are now available on our teacher resources page. This spring, full 8th grade lesson plans will be available. Moreover, we offer individually designed workshops to school-age groups inside and outside of the classroom, as our volunteers are available.